The last letter of the alphabet! My last cupcake post! This is so crazy to me. I can’t tell whether I’m excited (to move on to desserts other than just cupcakes), or sad to be ending such a journey. But I guess I’m kind of counting my chickens before they hatch… I better get writing if I’m actually going to finish this last post! Grate or shred two small zucchinis, or however much is necessary to get 2 cups of the grated vegetable. 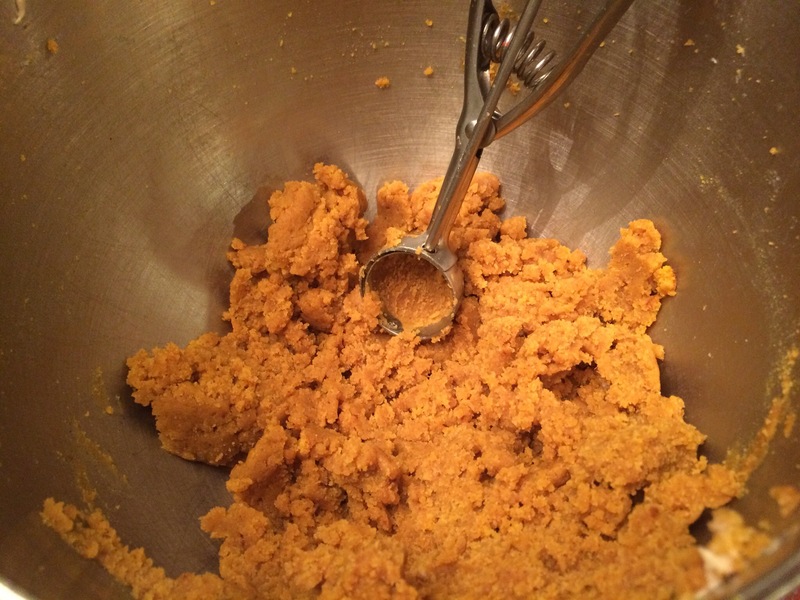 In a large mixing bowl or stand mixer, beat together the sugar and eggs until completely smooth. Add in the canola oil, applesauce, orange juice, and almond extract and mix until well combined. In a separate bowl, whisk together the flour, baking powder, baking soda, salt, cinnamon, and ground cloves. With the mixer on low speed, gradually add the dry ingredients into the wet and blend until everything is combined and there are no clumps. Add in the grated zucchini to the batter and mix until everything is just combined. 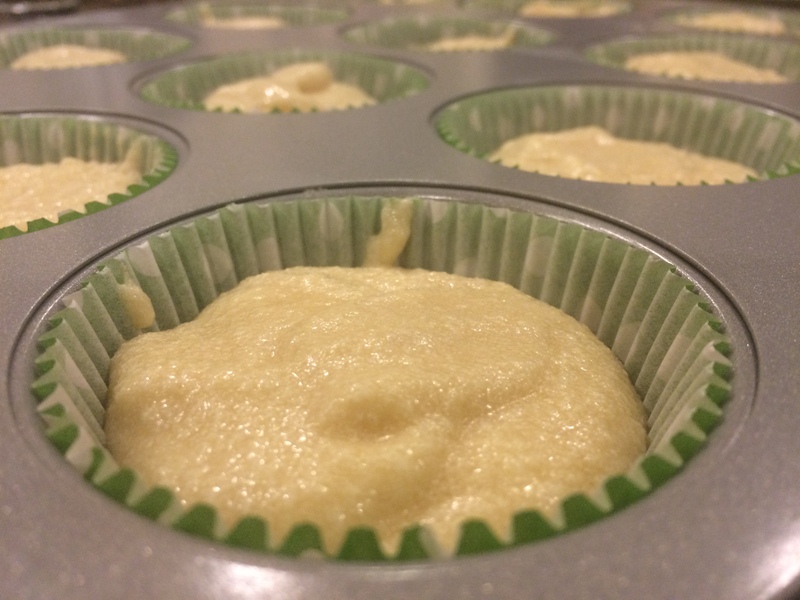 Scoop the batter into the lined cupcake tins, and place them in the oven. Bake for 15-18 minutes, or until a toothpick can be inserted and cleanly drawn out. Beat together the room temperature butter and light brown sugar on medium-high speed. Mix until it is light and fluffy and there are no clumps of sugar left. Then gradually add in the whipping cream. Continue to beat the frosting until it is a light, smooth butter cream. Then top each cupcake with a small bit of icing to keep the cupcakes flavorful, but not too sweet. These cupcakes are a delicious, fitting way to end the alphabet. At first, I had been thinking of doing a Zebra cupcake (like a chocolate and vanilla marbled cake–that’ll have to come some other time! 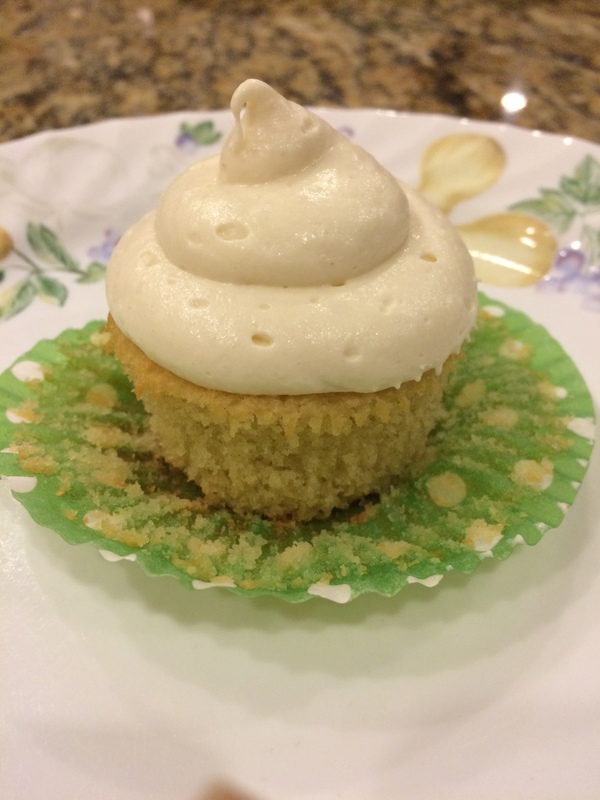 ), but I figured I should end with a proper cupcake where the “Z” was actually a flavor/ingredient in the recipe, not just a description (as has been my self proclaimed rule throughout 🙂). I started this adventure with a moist fruit (apple) cupcake, so ending with another deliciously textured, perfectly balanced vegetable (zucchini) cupcake seemed right. These are a great, unique dessert–and I promise they taste wonderful, and not at all like your typical vegetable side! 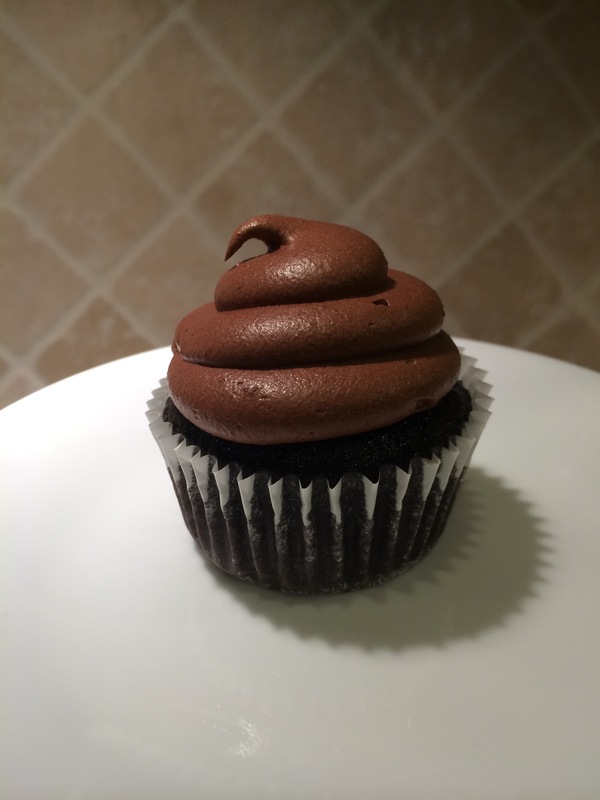 With that, I’m going to end my last cupcake blog post! That’s not to say that I won’t be doing more posts in the future; this blog is hardly something I could ever abandon. I just might now venture out to some other desserts, or maybe even just normal cooking recipes?? In the past few years, I can safely say that I’ve baked thousands of cupcakes, so I think a little break might be warranted. Plus, it’s a bit hard to find the opportunity to bake when I’m off at college now and my dorm doesn’t even have a functioning oven…! So it seems like the right time to (temporarily) close the cupcake chapter of my life and move on to exploring new desserts, new recipes, and new hobbies. We’re less than 10 minutes away from the New Year, so now seems like a good time to think about the future and all of the goodies to come in 2017. 2016 and the few years before have all been great, and I’ve loved sharing bits and pieces of them through my posts and through the blog. So everyone, please take care, and stay hungry! And thank you all so so much, for everything. Wow. It has been way too long! I’m so sorry for the radio silence… I’ve had quite a busy (and amazing!) year, but at the same time, I didn’t have much access to an oven or baking supplies. Still, I made it my goal to finish the alphabet by the end of 2016, so here come my last couple of posts (cutting it a bit close I guess!). Letter X. I knew from the very beginning that this letter would be my biggest challenge! Throughout this endeavor, I’ve been asking friends and family for suggestions, and finally we’ve come up with an idea. Xtabentún! This is a Mexican liquor that I had honestly never heard of before Googling “foods that start with the letter X” (really, it came down to a Google search!). Even then, it was only several posts in that I stumbled across this honey/anise flavored alcohol. Still, it didn’t take long to realize that this would easily be my best option, and it has honestly turned out to be one of my favorite recipes ever! In a large bowl or standing mixer, blend together the sugar and butter on medium-high speed until it’s light and fluffy. Then add in the three eggs, slowly and one at a time until everything is thoroughly incorporated. I recommend cracking the eggs individually into a separate small bowl first to catch any bits of broken shell that might have fallen in, and then add the egg to the mixer from there. In another large bowl, whisk together the flour, baking power, all spice, and salt. With the mixer on low speed, slowly add in the flour mix, alternating with the liquid Xtabentún. 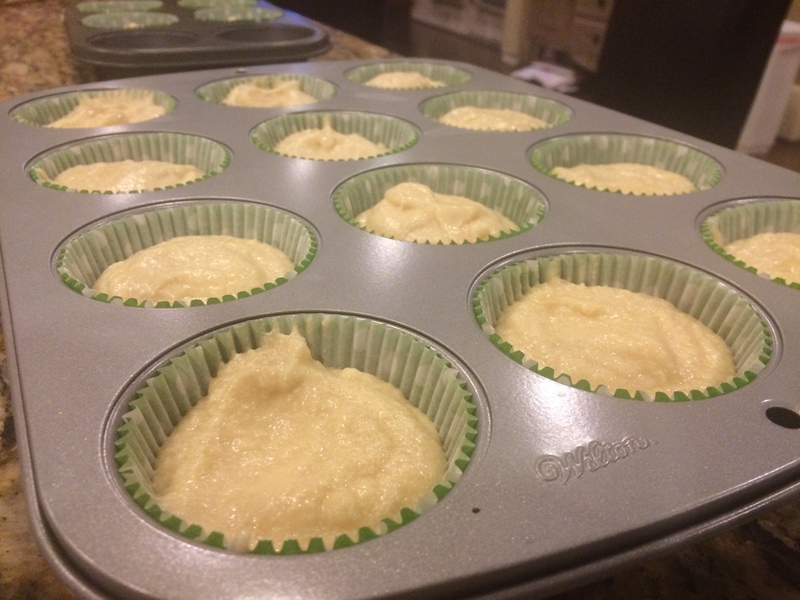 Then scoop the batter into the lined cupcake tray so that each is 1/2 to 2/3 full. Then place the cupcake tin in the oven and bake for 16-20 minutes, or until a toothpick can be inserted and drawn out with little to no crumbs. Then set them aside to cool. Beat together the room temperature butter and powdered sugar until the frosting is extremely light and fluffy. Once that is smooth, slowly add in the freshly squeezed grapefruit and lime juices until they are completely incorporated. Then fill a piping bag and top each of the cupcakes, with an optional sliver of grapefruit or slice/shavings of lime on top of the icing. These cupcakes, which I based off of various cocktail recipes using Xtabentún, are refreshing and delicious. They’re a perfect balance of sweet and tangy, light and moist. At first, I wasn’t sure in which direction I should go with this fermented honey, spiced liquor, but then I decided that if I’m going to be featuring a particular alcohol, I might as well run with it and use the same flavor pairings that work in cocktails to come up with something that would work in cupcakes! After a bit of experimenting, I can proudly say that I came up with this recipe and that it’s actually one of my favorites (seriously, not just because it’s mine)! 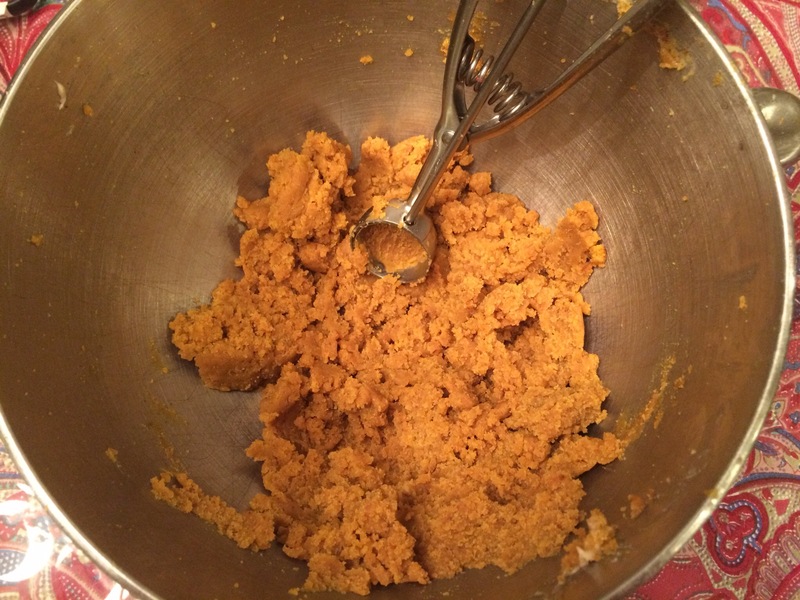 I decided to experiment on my own partially because I couldn’t find any other cake recipes featuring Xtabentún, but also partially because it was one of my last recipes; I wanted to see how far I had come since starting this blog as a total novice. After several years, I’m really proud of all of the ups and downs I’ve experienced with these 25 cupcakes so far, and I’ve definitely learned so much from my experiments, failures, successes, and opportunities presented thanks to The Amazing Bake. But before I get too sentimental (let’s save that for my last post! 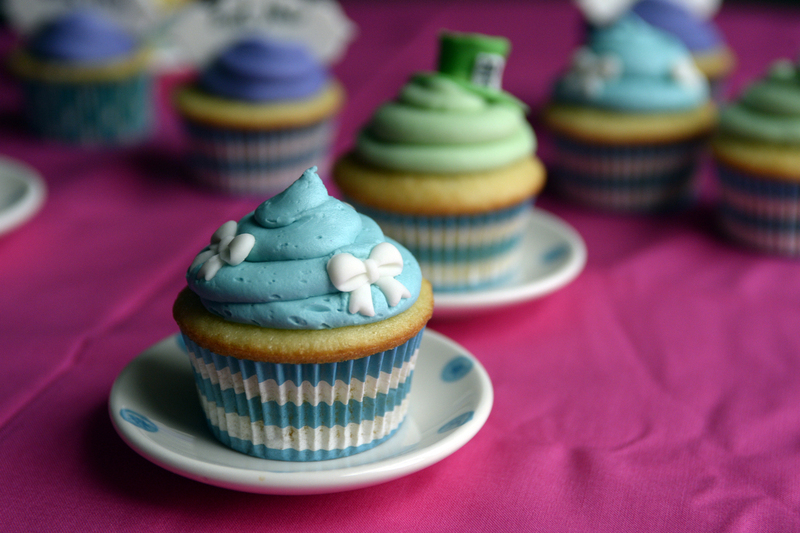 ), I briefly want to get back to my Xtabentún cupcakes. I just want to say that they’re definitely worth the (minimal) effort that they’ll require–it’s true that you will probably have to order the Xtabentún online (unless you’re planning an upcoming trip to Mexico! 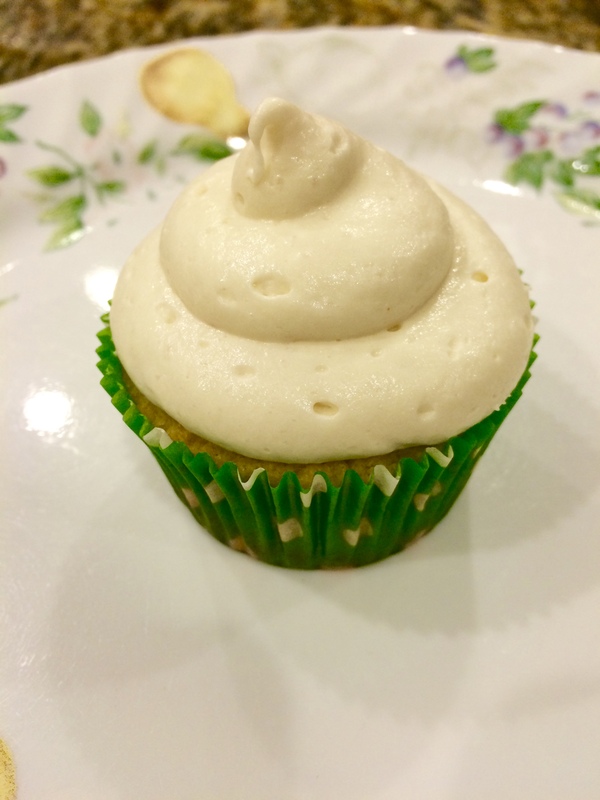 ), and I highly suggest freshly squeezed grapefruit and lime in order to get that refreshing taste–but those are small tasks for this wonderful dessert, and in the end you’ll have great cupcakes and a new liquor for other delicious drinks/desserts! So with that quick note, I encourage you to try this recipe, and maybe try come up with new ones of your own! Wow. So it has been an entire year since I’ve posted anything… and I feel a little–no, scratch that, I feel VERY MUCH–horrified that I’ve been so inattentive to this blog! I guess with the end of senior year, starting a different job, and just general life, I’ve been a bit distracted. I was also out of the country for several months (maybe I’ll have to start another blog for life/travels…?) with limited access to internet, but still, no excuses! (Right Sam??) Perhaps I should make my year’s New Years resolution be to post on this blog more often–especially since with a theme of cupcakes/baking, you know it can’t be for me to give up sweets…! 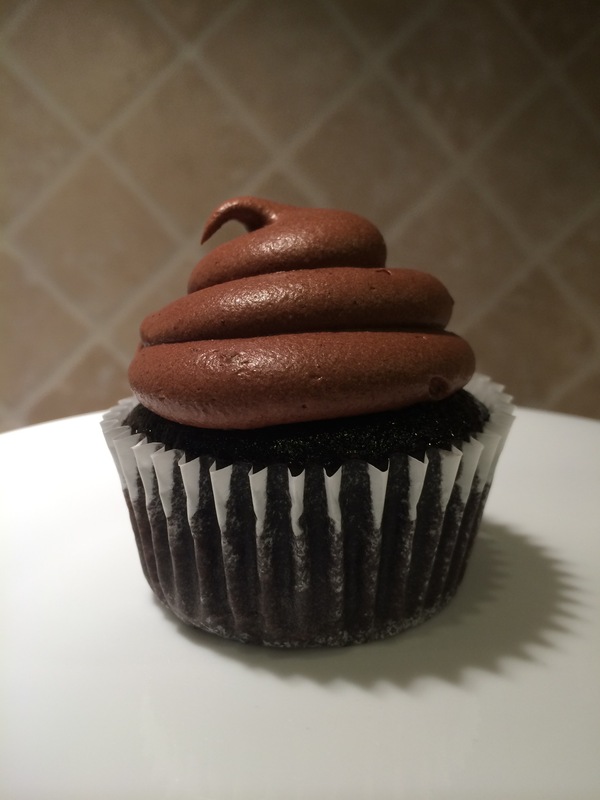 And speaking of, I better get to my latest cupcake post. Goodness knows I’ve kept you all waiting long enough! At least I can promise you, they’re worth the wait! I love these cupcakes. They are to die for. Diet-breaking worthy. Make-these-for-every-birthday-here-on-out worthy. If you haven’t quite picked up on it, these Yeast Cupcakes (adapted from a traditional St. Louis Gooey Butter Cake) are really yummy. They might not be the most beautiful cupcakes I’ve ever made (that title would probably have to go to my mint chocolate cupcakes, or maybe these butterscotch ones), but they definitely rank among the tastiest. They don’t take too much work either–just a good amount of time since the yeast needs to proof for several hours. But with an introduction like that, how could you not find time to make these? Seriously, these cupcakes are delicious and unlike any others, and I hope that piques your interest enough to give them a try! 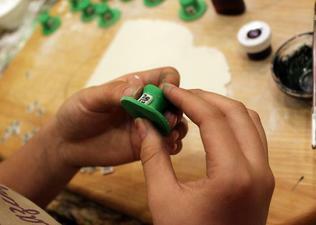 Start by lining either 12 or 18 cupcake molds with liners. Set aside. In a small bowl, mix the milk and warm water. Add the yeast and whisk gently until it dissolves. After a few minutes, mixture should foam slightly. 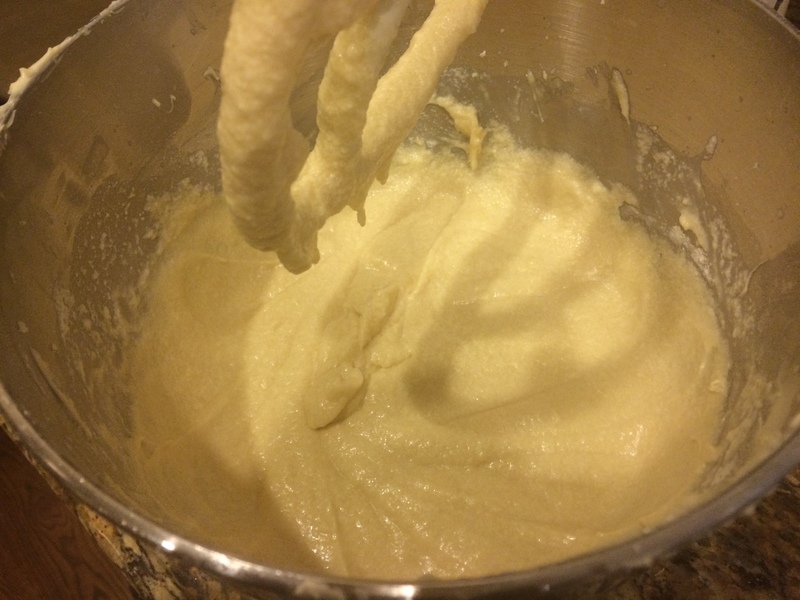 Using an electric mixer, cream together the butter, sugar, and salt. After scraping down the sides, add in the egg. Next, alternate between adding the flour and the milk/yeast mixture. Continue to beat mixture on a medium speed until the dough starts to pull away from the sides of the bowl–approximately 3-5 minutes. Note: I FILLED THESE TOO FULL! This dough easily doubles in size, so by the time my cupcakes rose, there was no room left for the topping! 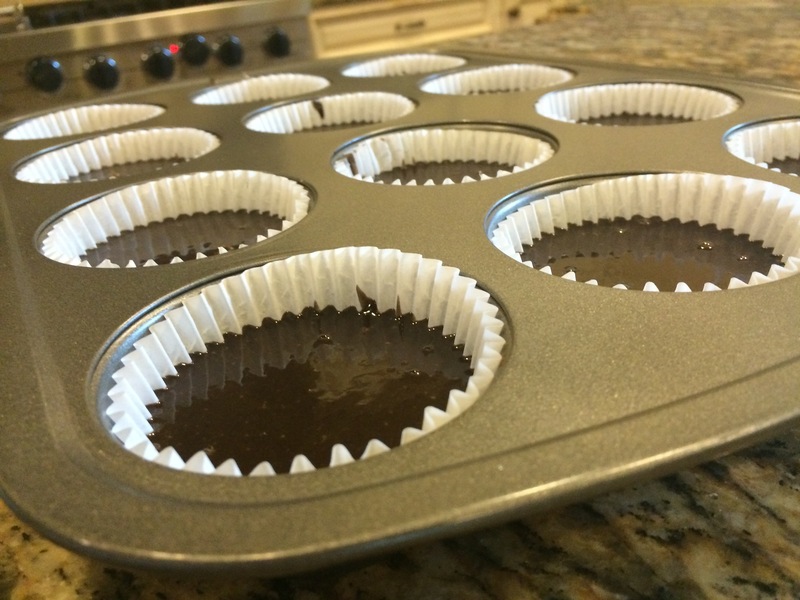 Cover the unbaked cupcake dough with plastic wrap or a tea towel, and put it in a warm place to let rise. After leaving it for 2 1/2 to 3 hours, the dough should have doubled in size. While letting the dough rise, you can prepare the topping. In an effort to make room for the topping, I tried to push down the centers of the cupcakes to form these little pockets. In the end, it didn’t work very well… (Perhaps actually cutting out the dough might have worked better than just squishing it down.) The dough just rose again in the oven–cue the massive *duh*–and ended up making a HUGE mess in my oven. I also piled on way WAY too much topping, as I was hoping it would hold its form better. It didn’t (see pictures below…) No worries, though, as I’ve learned from my mistake! Read below for my tips and solutions! To prepare the topping, start by mixing the Lyle’s Golden Syrup with the water and vanilla. Set aside. 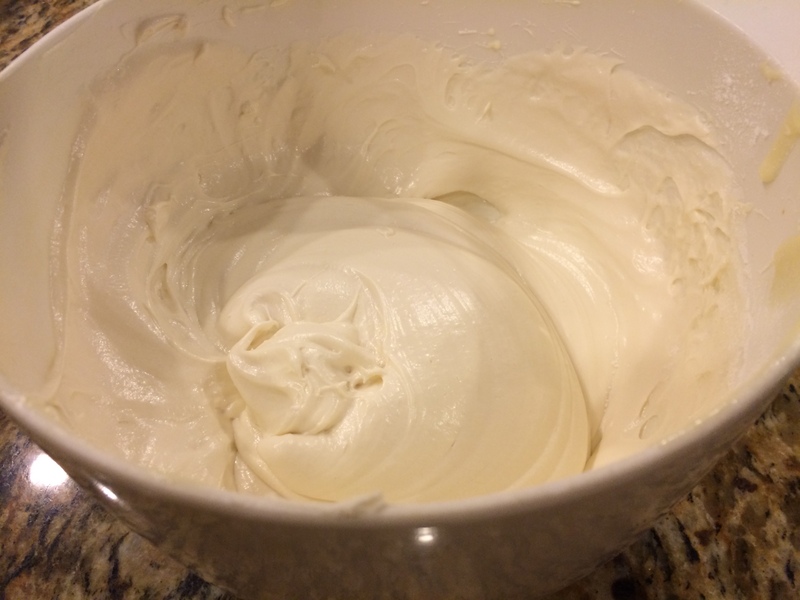 In an electric mixer, cream together the butter, sugar, and salt until light and fluffy–about 3 t0 5 minutes. Scrape down the sides and beat in the egg. Alternate between adding the flour and syrup mixture, scraping down the sides after each addition. Spoon the topping in large dollops over the risen cake dough. The cake portion will rise even more in the oven, so take note of that when adding the topping. Spread the topping over the dough as evenly as possible. Bake the cupcakes for 27-32 minutes or until the top has turned golden brown. 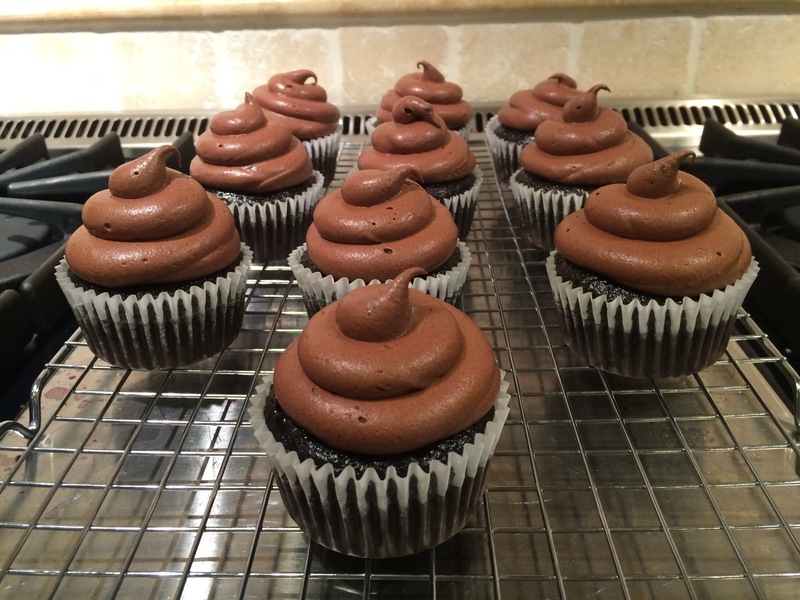 There may be waves or uneven areas on the cupcake’s surface, but this is normal. The center should still be liquid-y and gooey from the topping as well, even when done. Allow cupcakes to cool before dusting the tops with powdered sugar (optional). So. I ADORE these cupcakes. It’s a shame that Letter Y is so late in the alphabet because oh how I wish these cupcakes had come into my life sooner! That being said, it wasn’t the prettiest path getting here… and I mean that very literally. I completely misjudged how much the dough would rise, the fact that the topping would melt more than hold its form, that these cupcakes would expand a ton while baking, etc. 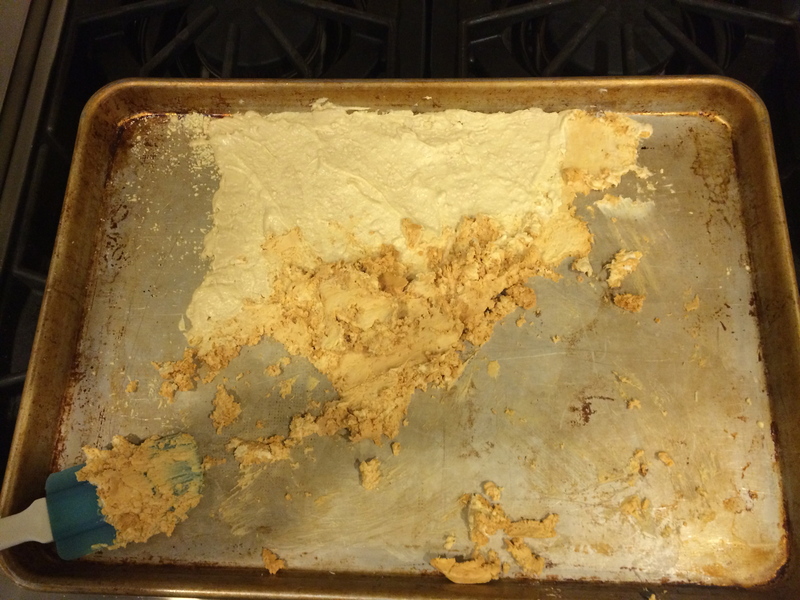 The result was an overflowing, sticky, baked, crusty, (yummy), pedagogical mess. I will be sure to post pictures below. I will also, however, post the very helpful tips and lessons I have learned! Definitely place a baking sheet underneath these cupcakes. I had an inkling of the disaster that might occur with the spillage when I first tried out these cupcakes, so I luckily placed a baking tray underneath the rack in the oven; thank goodness!! It didn’t catch all of the overflow, but I shudder to think of how overwhelming the cleanup task (already a big feat) would have been without it. 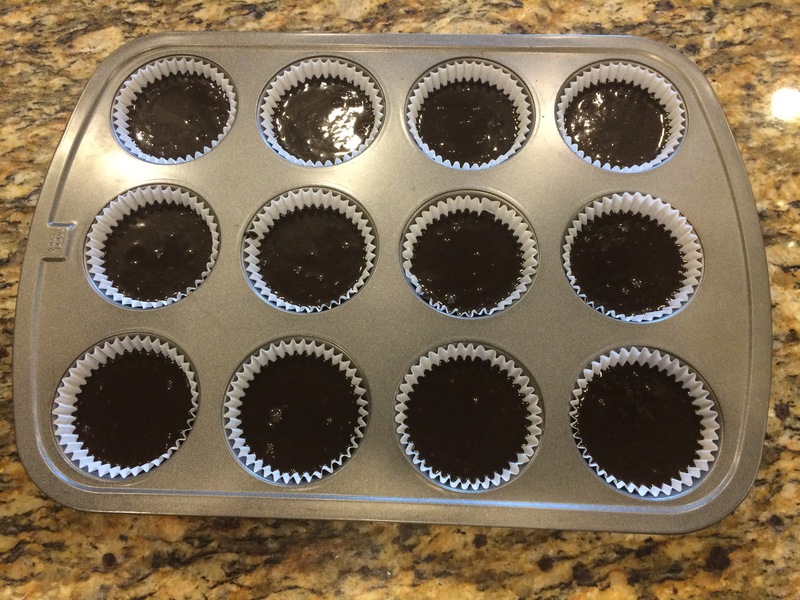 In case you’re wondering, I ended up making two batches: my first attempt had a baking sheet on the rack below, so it wasn’t directly touching the cupcake tin; in the second batch, I put the cupcake tin right on top of the baking tray. I feel like the second batch was just a tiny bit drier than the first, but they were still completely delicious. I can’t definitively say whether that was due to the direct contact with the baking tray (more direct heat to the bottom of the cupcakes, less air circulation) or whether I just left them in for a minute longer. The dryness was honestly negligible to me, for which I have proof since I think I devoured the second batch even faster than the first! If you decide to make these (*highly recommend! *), it’ll just be up to you on whether you want to risk some uncaught overflow with the first method, or hazard a slightly drier cupcake but with a guaranteed easier cleanup. My other tip is regarding the topping. If you enjoy having a more authentic cupcake feel, with majority cake and minority topping, then certainly feel free to use more dough in the bottom (in my pictures above, I used pretty much all of the dough split equally between 12 cupcakes–they rose to be about level with the edge of the tin, so I then had to try to create some room/pockets for the topping); this will obviously leave less room for the topping, but I promise you that the end cupcake will still be sweet enough and completely delicious! If, however, you’re familiar with a traditional St. Louis Gooey Butter Cake and prefer a nice, substantial layer of topping that rivals the thickness of the cake, you have two options. Firstly, you could put less dough in the bottom of each tin, in which case you might be able to get anywhere from a few to a half dozen more cupcakes out of this recipe. This will obviously leave you with more room in the tin for topping, even after the dough has expanded and risen. I have not personally tried this method, so I cannot say how it might affect baking time, but I’m sure checking the cupcakes just a few minutes earlier than usual will take care of that. 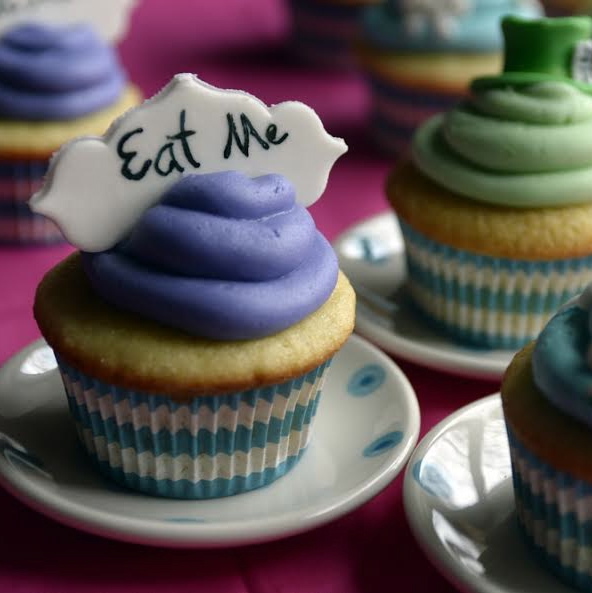 The second option is to use higher cupcake liners (see pictures below). I bought mine from Michael’s, and while they did add some height and effectively increase the topping amount a bit, because of the way they were folded, there were still some short areas where the topping was able to escape and overflow. Next time, I’ll probably just fold some of my own! Or maybe add a height extension cuff kind of thing to normal liners… basically, time for more experimenting! If you, however, don’t feel like reliving arts and crafts class, the liners from Michael’s (or any tall liners you can find) will work just fine for adding a bit more space for topping. The taller liners do, however, slightly accentuate the fact that these cupcakes sort of fall/settle so that they have a wavy, bumpy top. In some places, the cupcake might sink a bit, and the baked crust left on the paper leaves a subtle trace. I don’t think it matters at all (especially since the best part of these cupcakes is not really their aesthetic value) but you can see my pictures below and then decide. At the end of the day, whether you have just a little topping or a lot, extremely messy cupcakes or instagram worthy treats, or any other form of these desserts, I don’t think you can go wrong! They’re so delicious, and they’re a unique hybrid between a traditional cupcake and a traditional gooey cake. Best of both worlds! These cupcakes must be pretty damn tasty if I love them even after this fail/mess! I hope this post makes up for a year of silence! If there’s one thing that I’ve learned while working on this blog, it’s that cupcakes can solve damn near anything! Hopefully this post works. 🙂 Love you guys! I have been looking forward to making these white chocolate cupcakes for months! 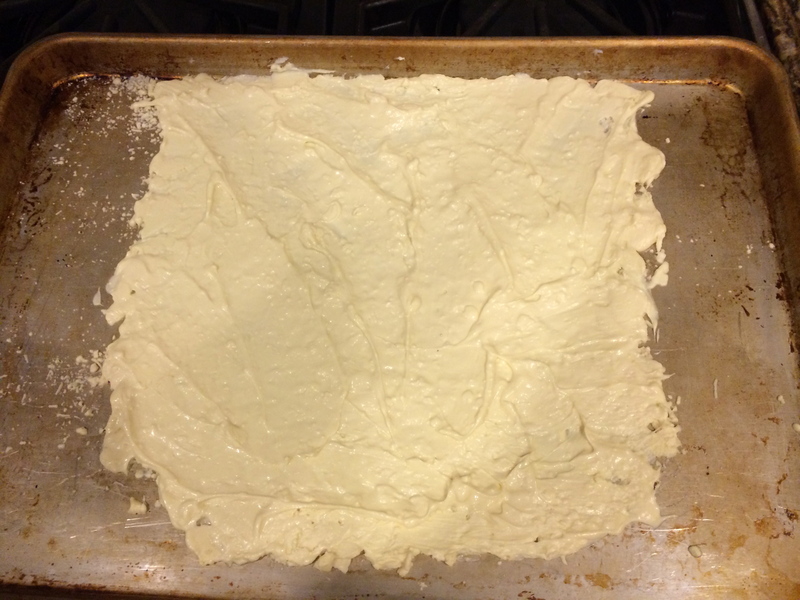 I absolutely adore white chocolate (even if it’s not technically chocolate…), and I’ve planned on doing this flavor ever since the beginning of The Amazing Bake. And just like with many of my other recipe ventures, I discovered something totally new while researching for Letter W! 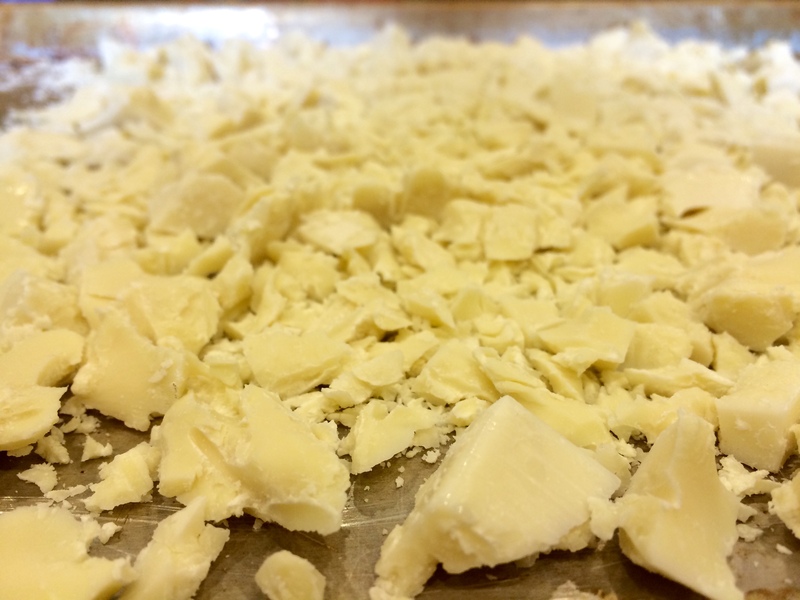 Have you ever heard of caramelized white chocolate? I definitely hadn’t… Once I started looking into it more though, I found out that it is SUPER cool! 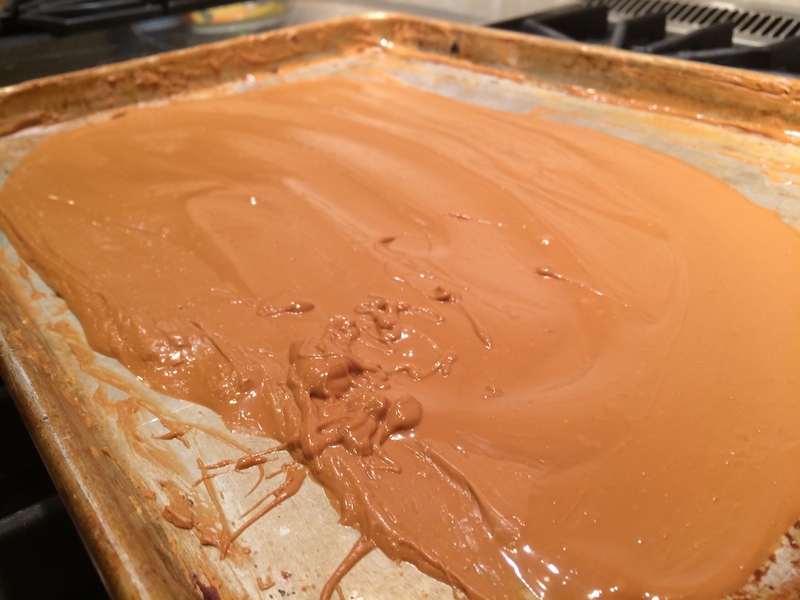 I mean, I’m totally a food geek I guess, but I think it’s amazing that you can turn a hunk of white chocolate into a slab (or ganache, in my case) of caramel-y goodness! That’s what caramelized white chocolate is, although it retains some of the original white chocolate flavors even after the whole process. 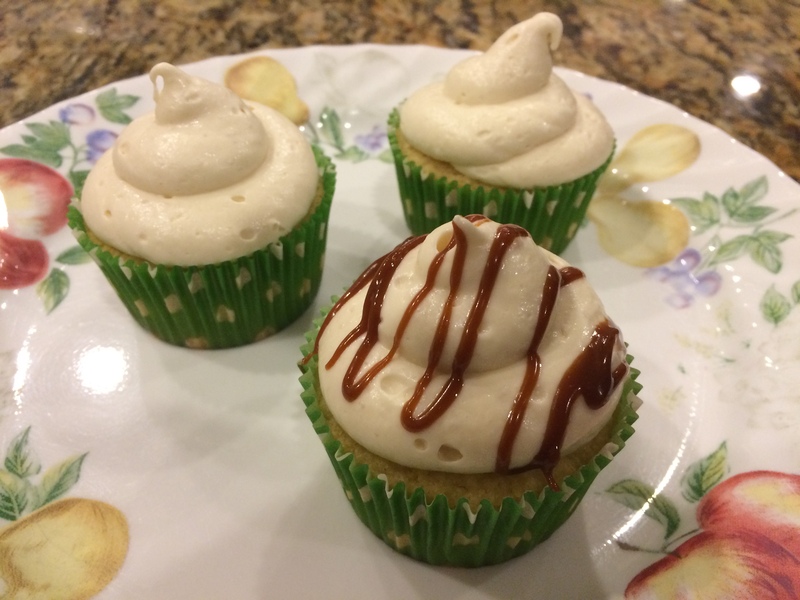 It makes sense, since white chocolate is basically just a mix of fat, dairy, and sugar, but I still had never thought of caramelizing it until I began to work on Letter W. Anyway, I just wanted to share some of my excitement and wonder that I’ve experienced while making these white chocolate cupcakes! I hope you enjoy, and please read through the bottom to see some of my advice, regrets, choices, etc. Thanks! 1. Preheat oven to 350 degrees and line cupcake tins with 16 liners. 2. 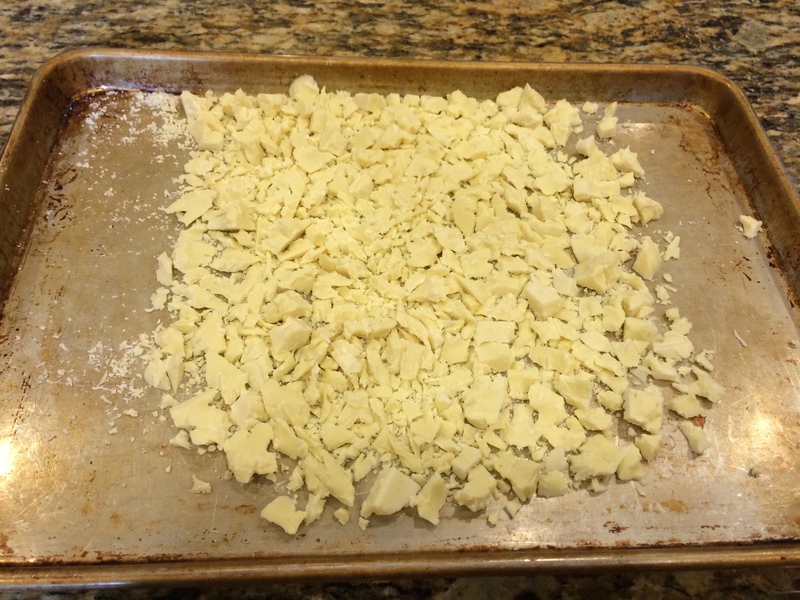 Place chopped bits of white chocolate in a heatproof bowl or in the top of a double boiler. Fill a pot or the bottom of the double boiler with an inch or two of water so that the top bowl can rest without touching the water, and heat it until simmering. Place bowl with chocolate on top, careful to make sure that none of the water gets into the chocolate. Stir until the chocolate is melted, remove from heat, and let cool until tepid (lukewarm). 3. In a small bowl, mix together both flours, baking powder, and salt. 4. In a measuring cup, mix together the milk and vanilla. 5. In a stand mixer (or a large bowl, if using a handheld electric mixer), beat together the butter and sugar until light and fluffy. Beat in the eggs, one at a time, waiting for each egg to be completely incorporated before moving onto the next egg/step. Then add in the flour mixture and milk, alternating in little batches between the two. 6. Fill the cupcake liners with batter. They should be basically full, as these cupcakes only rise a little bit. 7. Bake them in the oven for 13-15 minutes, or until a toothpick can be inserted and drawn out cleanly. I’ve found that these cupcakes go from perfect to overdone very quickly, so stay vigilant and check them a few minutes early if you’re worried. They should still be a whitish yellow all the way through and only go golden when they’re overdone. After cooling for 10-15 minutes in the pans, remove the cupcakes and let them cool fully on wire racks. 8a. 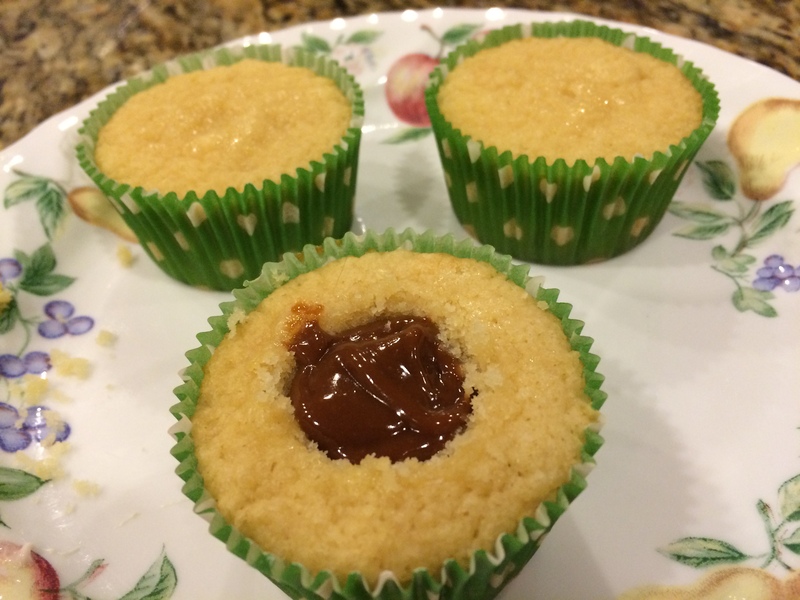 If you’re planning on filling these cupcakes with the caramelized white chocolate ganache (or you could use jams/other filings), cut a hole out of the center of each cupcake. These should not go all the way to the bottom. If it’s easier, you can use a knife to cut out a cone shape, although I found even when cutting out a hole that was shaped more like a well, you could still use the tip of the knife to easily loosen the bottom of the cut part of the cupcake and pop it out while leaving the bottom of the cupcake intact. i. Next, use the ganache (if it has been stored in the refrigerator, pop it in the microwave for a few seconds until it’s warm enough to scoop/drizzle) to fill the holes. Fill them until the ganache is flush with the top of the cupcake. ii. Frost the cupcakes as you would regularly, using the icing to cover up the hole and ganache. 8b. If you’re not planning on filling these, just skip the past few steps and frost the cupcakes once they’re cool. Melt the white chocolate bits with the same method as used above with the cupcakes. Let cool until tepid. Gradually mix in the confectioner’s sugar, adding it in in slow increments so as to avoid a mess. Slowly mix in the cooled white chocolate and vanilla. For a denser frosting, use it just after all ingredients have been mixed together smoothly. For a fluffier, lighter frosting, keep beating for several more minutes. 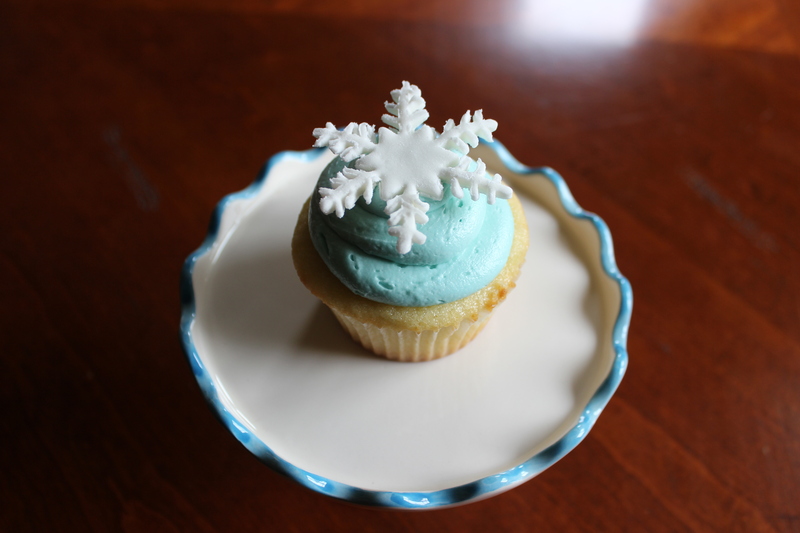 If the frosting appears to be too soft, place it in the fridge for a short period of time before using it to frost. Also, if your chocolate was still warm when added, it may have melted the icing a bit so it appears soft. Once the chocolate has a bit of time to firm up (either in the fridge or ten on the counter), your frosting might thicken as well. 2. Lay the chopped chocolate onto a baking tray. 3. Place in oven and bake for 10 minutes. 4. Remove the white chocolate and stir it with a clean spatula. Move around the pieces so nothing burns on the bottom, depending on how melted the chocolate is, start to mix it together. Spread it out in a thin, even layer again as best you can. Place the baking tray back into the oven. 5. Continue to bake for 10 minutes, remove and mix, spread the chocolate out again, and put back in the oven. (You’ll repeat this process for 60-90 minutes most likely). 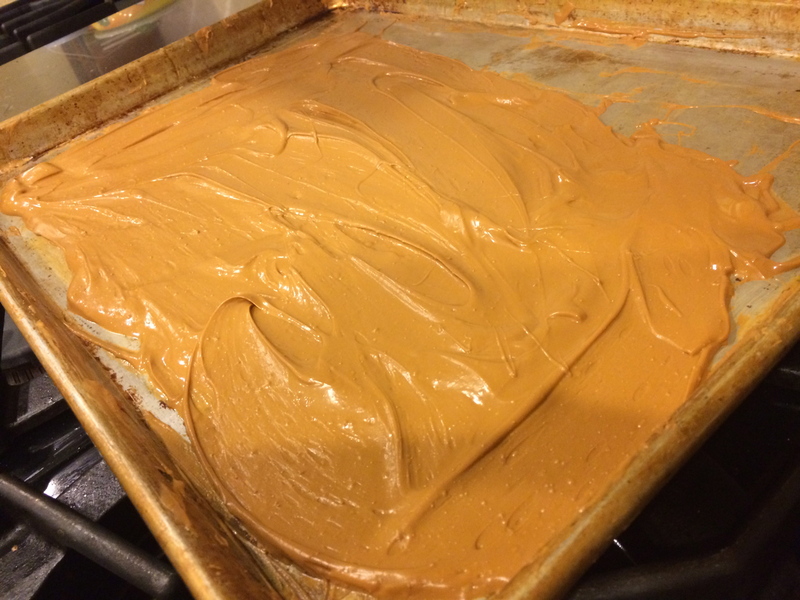 The final product should be a warm caramel color, slightly darker than peanut butter. When you reach this color, take out your chocolate and let it cool. 6. 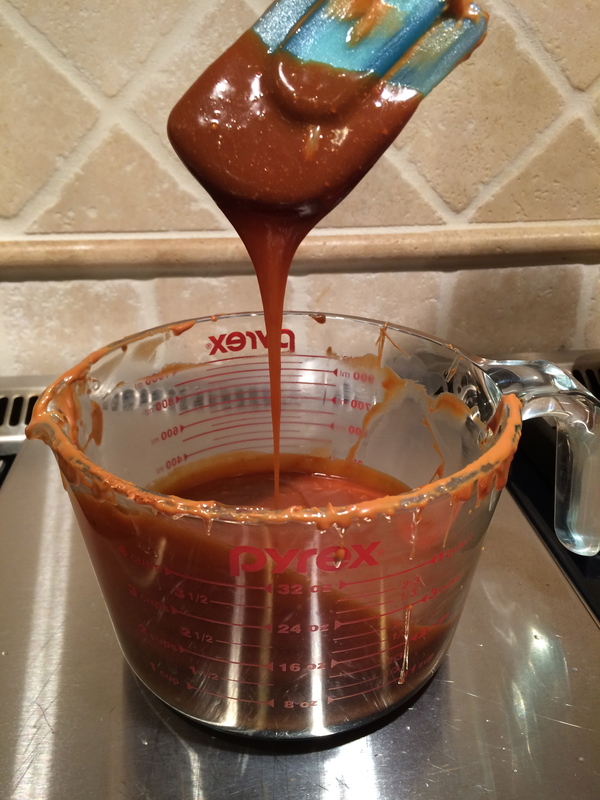 If your goal is just to create caramelized chocolate, you’ve done that! At this point, you can scoop the chocolate into a glass container while it’s still melted, and it’ll cool with the same consistency as chocolate (so definitely solid at room temperature). It will keep in a sealed, room temperature glass container for weeks, if not months (although I seriously doubt it would last that long!). Note: For the first time or two you remove the chocolate from the oven, it will most likely be extremely dry, stiff, pasty, and not at all smooth. 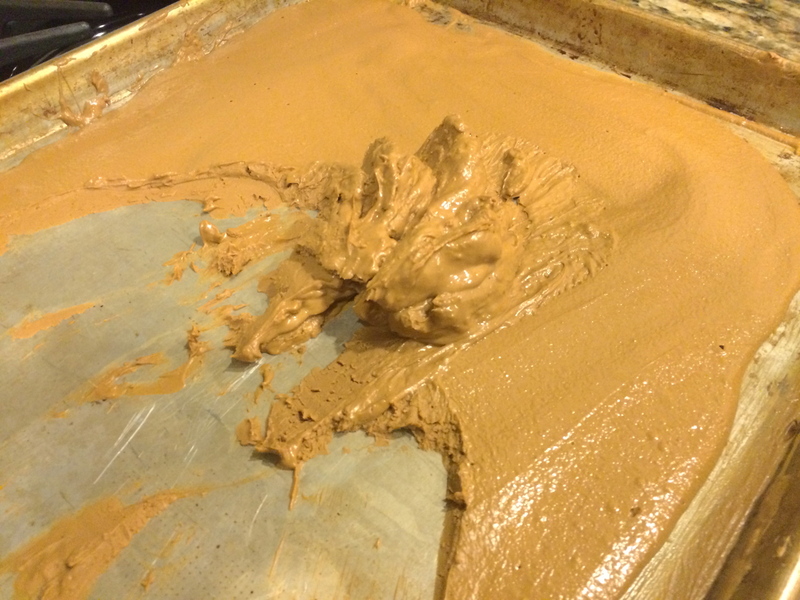 Keep mixing it for several minutes, working and stirring the chocolate until the color is even throughout and it’s generally one uniform blob. After putting it back in the oven and repeating this process for a couple of times, you’ll eventually reach this magical moment: after you’ve been stirring the crumbly chocolate for several minutes, it’ll start to come together until it can be smoothed out and actually resembles melted chocolate. 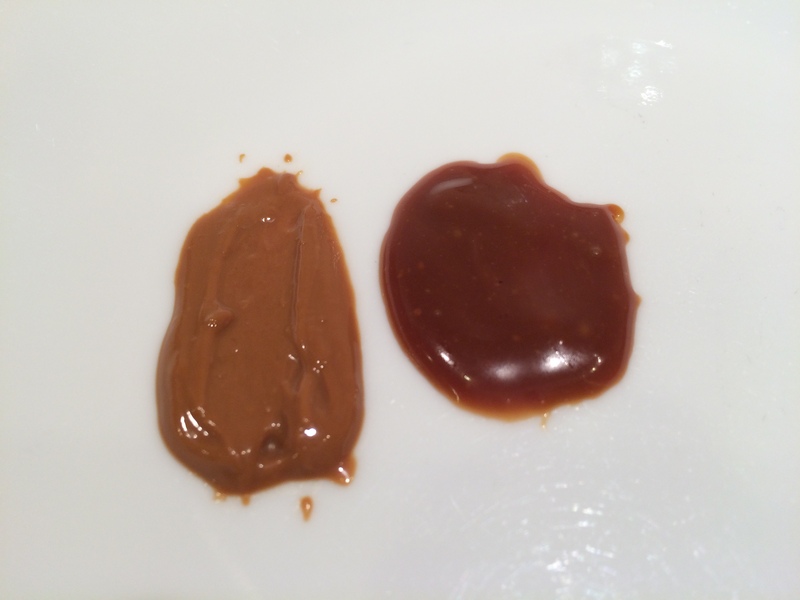 Keep mixing that until it’s as smooth as you can get, and from then on out, each time you remove the sheet you should be able to work with the chocolate so it eventually returns to that soft, creamy, texture. As much as you may want to taste the chocolate then, do not!! It’ll be quite hot. Patience will be rewarded! Smooth and a beautiful caramel color – my camera didn’t do it justice! If, at some point, you choose to turn it into a ganache however, this is where you’ll use the heavy cream. 7. First, break up 8 ounces of that caramelized white chocolate into small bits and put them into a heat proof bowl. Set aside. 8. Heat the cream in a sauce pan until it’s steaming and just starting to simmer. Remove it from the heat. 9. Pour the cream over the caramelized chocolate bits and let that sit (before stirring it) for a minute. 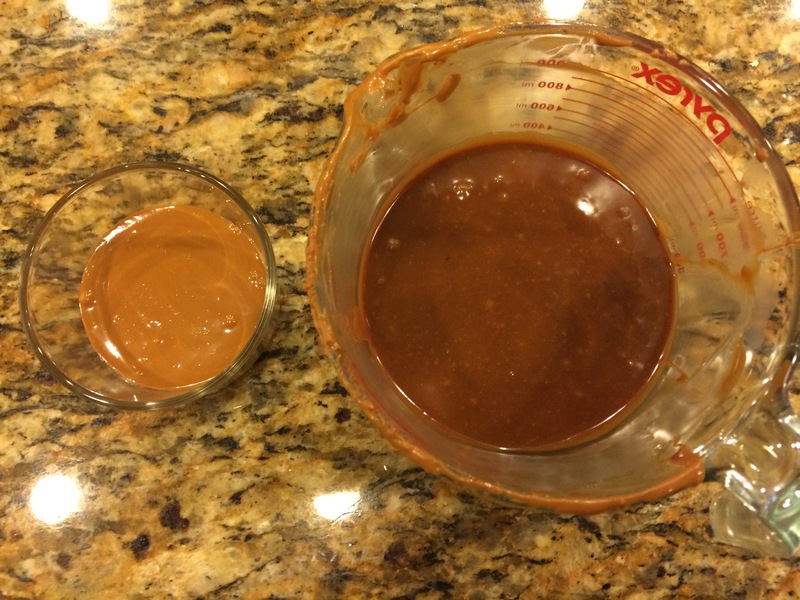 After a minute or two, once the heavy cream has had a chance to heat and melt the chocolate, stir the mix together until you’re left with a smooth, thick, delicious ganache! If you try nothing else from this recipe, please try the caramelized white chocolate. PLEASE. Even if you don’t use it to fill these cupcakes, it makes a great topping for ice cream sundaes, brownies, and plenty of other things. If you haven’t picked up on it already, I am OBSESSED with that stuff! 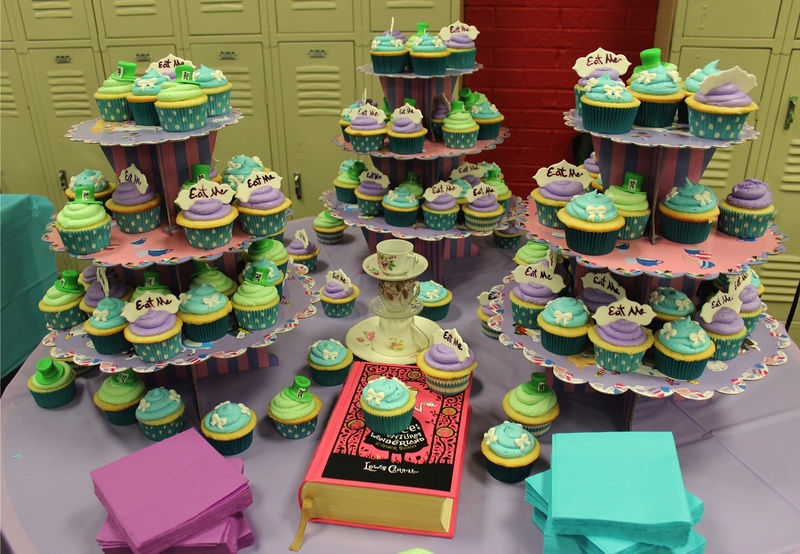 Seriously, I considered eating it all and not even baking the rest of the cupcakes…! But of course, I would never actually do that–especially since white chocolate cupcakes sound delicious, too! I will say, however, that this recipe has been a bit tricky for me. The first time I made them, I was still playing around with how long to bake them for, and I way over did them. Of course I would mess up one of the few recipes that uses a somewhat expensive ingredient! (On a side note, if you’re looking for high quality white chocolate that isn’t crazy expensive, try going to Whole Foods. While I know that sounds really surprising since Whole Foods is generally pretty pricey, they actually sell blocks of Callebaut white chocolate that are about $5 for 8 ounces. I’ve found this is somewhat on par with the prices that you’d find at a grocery store, but the chocolate is of a much higher quality!) Anyway, when I baked the next batch, our oven was acting up (extremely uneven heat distribution…) so the top rack was over baked once again, but the bottom cupcakes came out perfect. No worries though, because I think I’ll make some cake pops out of the dry cupcakes! I did frost the rest of the white chocolate cupcakes, and I think they were really good! However, PLEASE NOTE: if you’re planning on filling the cupcakes with ganache like I did, I highly recommend cutting the sugar in the cake and frosting! Believe me, I have a huge sweet tooth (I have a cupcake blog, for Pete’s sake), but these cupcakes were even a bit too sugary for me! I haven’t experimented yet, but perhaps try 1/2 to 1/3 cups sugar in the cake part and 1 cup confectioner’s sugar in the frosting (those are totally just guesses though!). Remember, the white chocolate will add sweetness too, along with the ganache filling obviously. I can’t believe I didn’t think of that factor before making my batch though! Oh well. I never set out to be perfect, and I don’t mind making mistakes if they might help some of you! 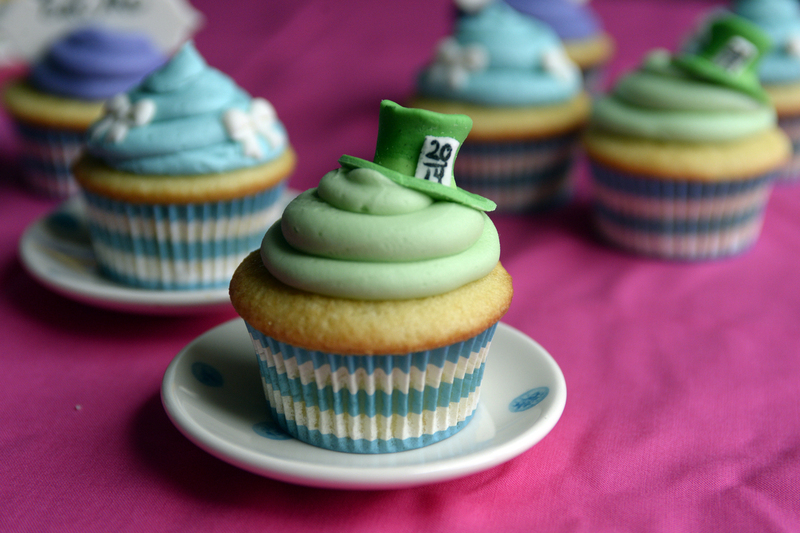 Still, I’m happy with these cupcakes, and I’m also just happy to have had time to work on my blog over the holidays! I hope you all have had a great holiday season and New Year. This time of year is perfect for reflecting and giving thanks, and I am so appreciative of my family, friends, community, and you guys who read my blog! I can’t believe how far the Amazing Bake has come since I started it in January of 2012, and fingers crossed that it’ll continue to grow this year. Cheers to a happy, healthy (along with the occasional decadent desserts), and productive 2015! Take care everyone. With Thanksgiving right around the corner (aka tomorrow! ), I’m loving all of the pumpkin, sweet potato, and spicy desserts that are ubiquitous this time of year. If you guys are looking for super easy, delicious fall recipe, definitely check out my pumpkin cupcakes that I made a few years ago. For me, it’s a go-to staple now! I’m currently working on letter W (there’s a special component/extra for this one that I am SO excited to share with you), but for now, I don’t want to leave you empty handed for Thanksgiving. So, for the first time ever, here’s a non-cupcake recipe for you guys! 1. Bake the cupcakes according to the original recipe. Let cool. 2. Add about a dozen cupcakes (removed from their wrappers) to an empty stand mixer. 3. Before mixing, add in about 1/4 cup of frosting. Turn the mixer on and best until well incorporated (but don’t over mix, as you don’t want it to be mushy). 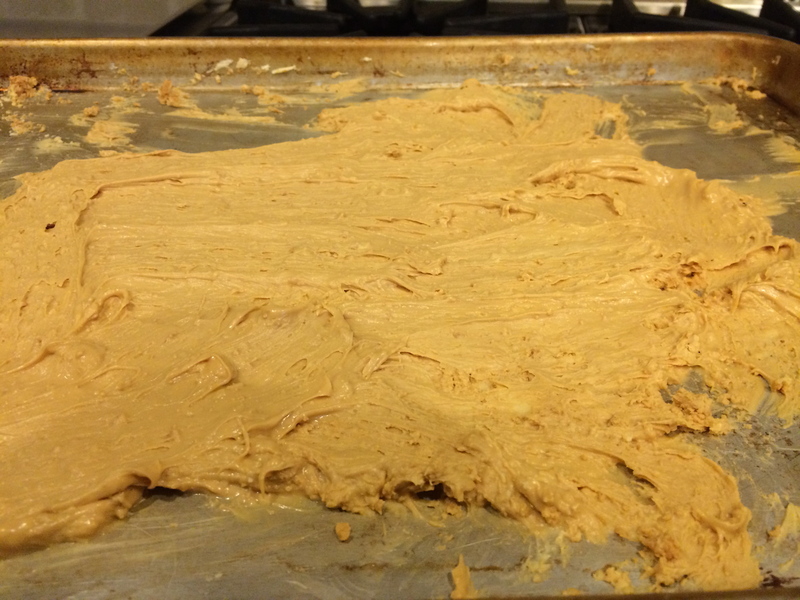 Add in small amounts of frosting if the mix is too dry and still crumbling. However, the mixture doesn’t need to be smooth in the stand mixer; even if there are crumbs or it doesn’t look moist enough, try forming a cake pop ball first to see if it will stick together. 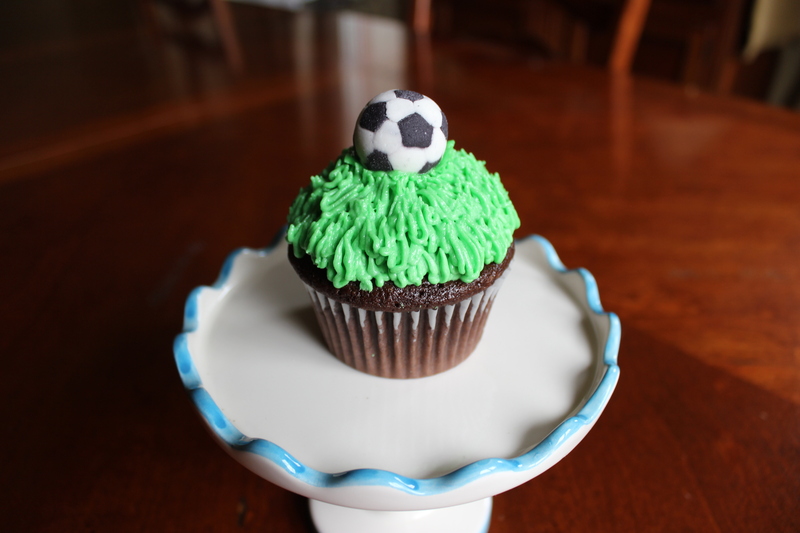 So long as there’s enough frosting for the ball to keep its form, you’re fine. If you add too much frosting, the cake pops will be too dense and won’t have a nice texture. 4. 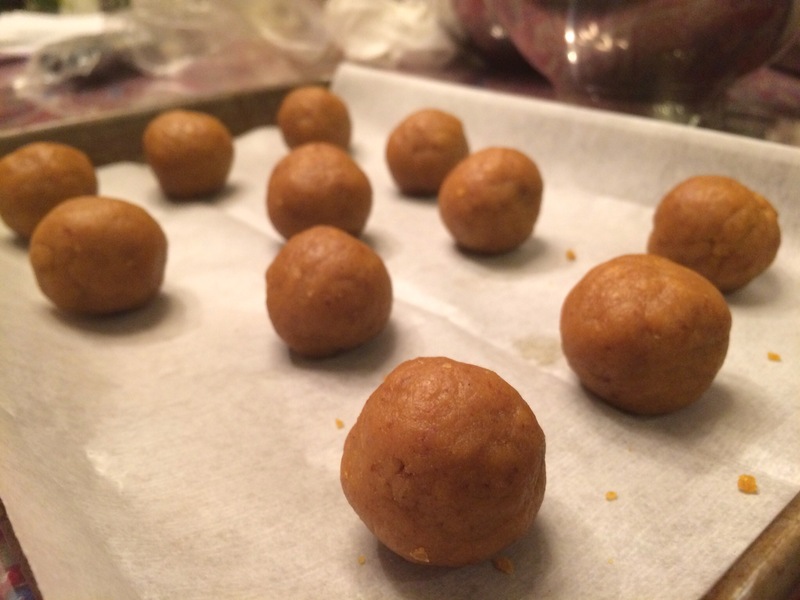 Roll the cake/frosting mixture into balls, about the size of golf balls. Stick on a baking sheet and put in freezer for about half an hour. 5. 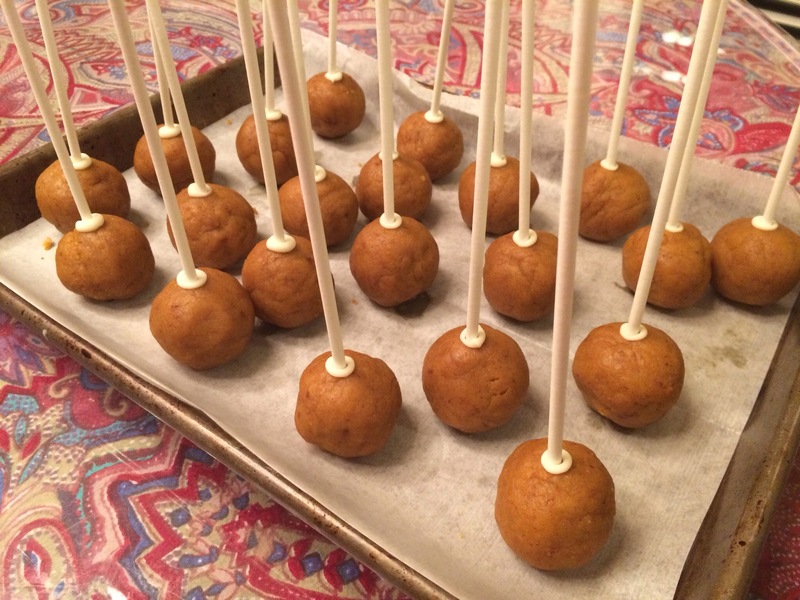 Take the cake balls out and also get your cake pop sticks ready. Melt a small amount of white chocolate or candy melts, and dip the the last centimeter of the sticks into the melted chocolate. 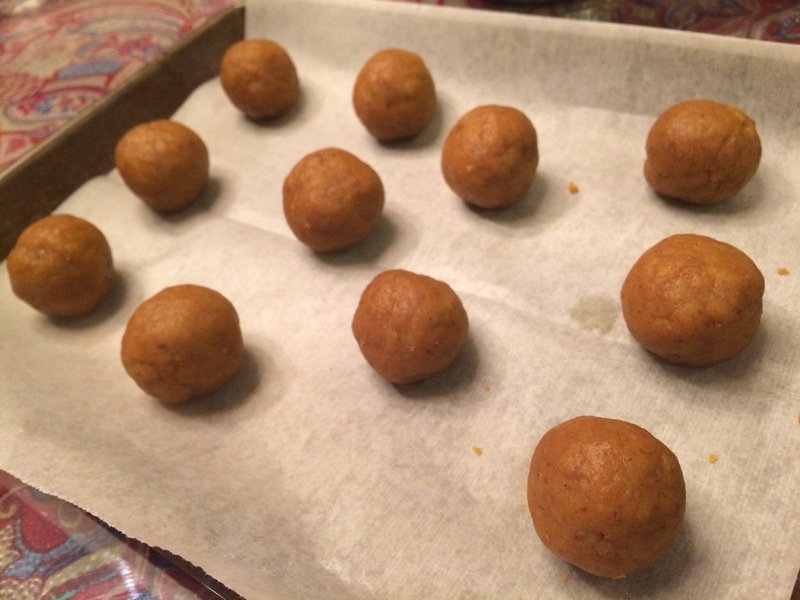 Insert the coated ends into the cake pops and stick them back into the freezer for another 15 minutes. 6. Melt white chocolate or candy melts in a microwave proof bowl that is big enough for you to submerge or at least twirl part of the cake pops in. If your candy coating is too thick even when melted (and is pulling the cake off of the stick or causing it to break), try adding a small amount of coconut oil to thin it down. I work in smaller batches of about 1/2 – 3/4 cups chocolate melted at a time just so I don’t end up melting more than I use. It cools and thickens eventually, but I just pop it back into the microwave. 7. After lightly coating the cake pops (you don’t want it to be too thick, otherwise the cake to coating ratio will be off), you can either lay them stick-up on a baking sheet to cool , or you can get a clean block of styrofoam and poke the sticks into that, so the balls cool upright and remain perfectly smooth. (I poke holes ahead of time so that it’s easier to get the sticks in; just make sure that you space the holes far enough apart so that the bigger, top heavy cake pops don’t hit each other). Using styrofoam is definitely more work though, and the cake pops will still taste just as delicious even if they harder on a baking sheet. 8. If you feel like it, you can add some food coloring to the coating and pipe some squiggly lines over the tops for decoration, or you could use sprinkles, dark chocolate, or nothing at all! 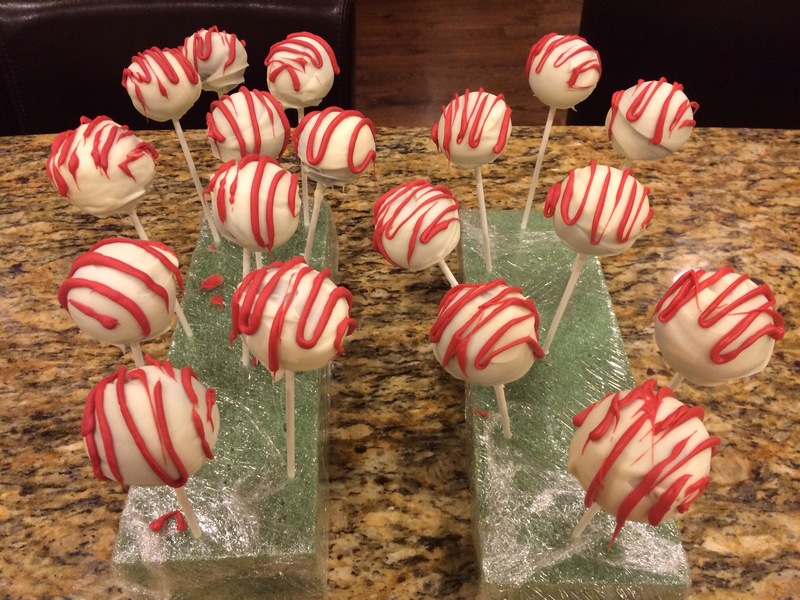 These cake pops have been one of my biggest hits with friends and family. And honestly, they started from a mistake! I had over baked a batch of cupcakes, plus I also had some extra frosting on hand, and I just didn’t feel like wasting so much food (not to mention the time I had put into making them!) One of the reasons why I LOVE cake pops is because they’re great for using over baked/mess-up cupcakes. If you ever have cake that is just too dry to use for cupcakes, make them into cake pops and nobody will ever know! 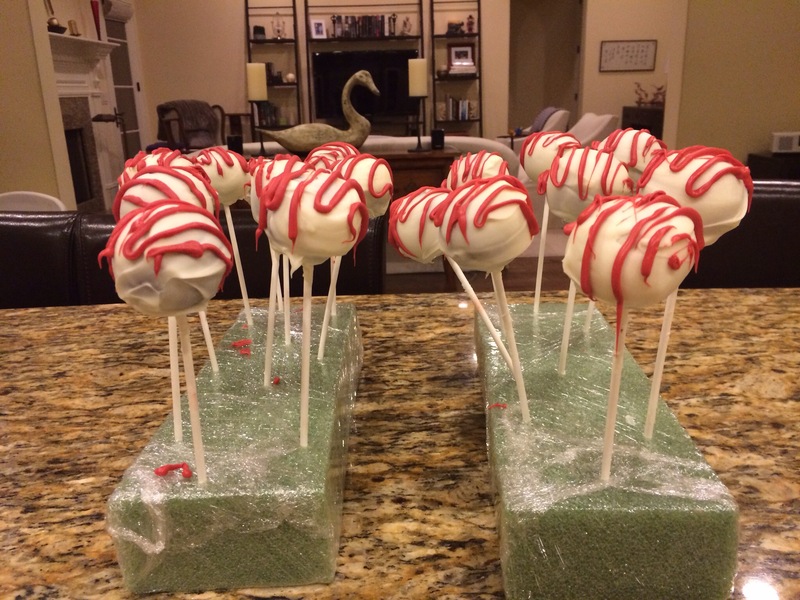 If the texture is weird, the cupcakes are sort of ugly, or you just have extras, make them into cake pops. Honestly, I don’t know if I would normally make cake pops from scratch without leftover cake because they do take a bit of work/a lot of steps. 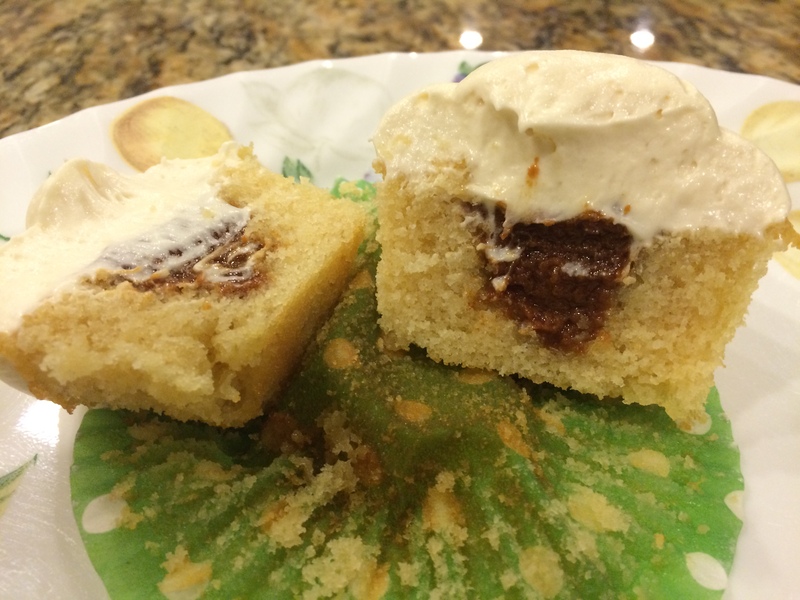 However, they’re so convenient for hiding baking mistakes, and you can use this basic recipe/technique with any flavor of cupcakes that you make! 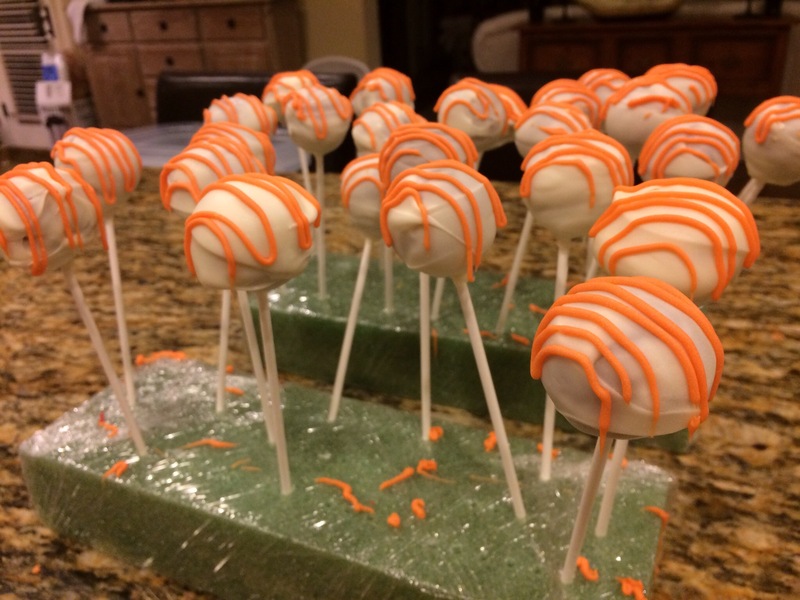 So, while I particularly love these pumpkin cake pops, especially around thanksgiving, please consider making cake pops any time you have a baking misstep, as they’re a delicious way to save some cake and impress your friends. Sometimes the best recipes are worth the wait, right? 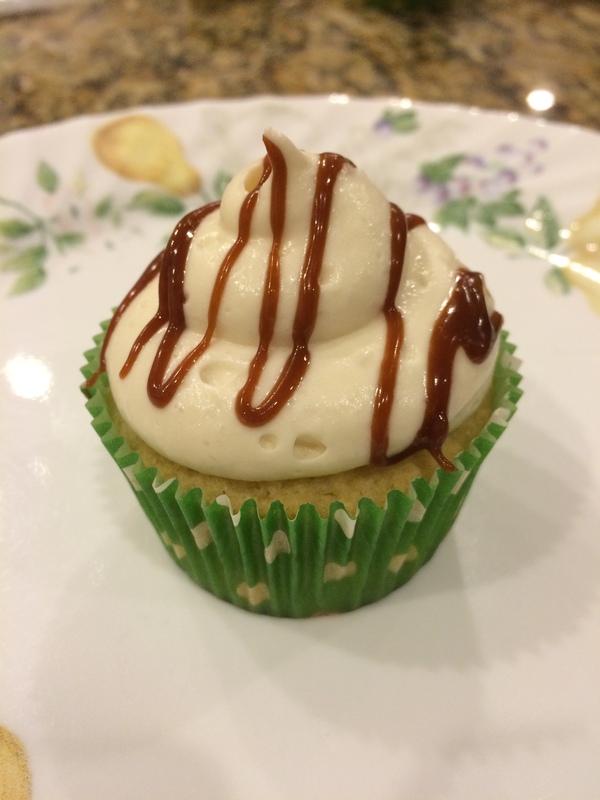 I’m hoping you guys will agree, as I have a fantastic vegan cupcake recipe to share with you! Seeing as my name also starts with the letter V, I felt as if there was great pressure to come up with a recipe that would do such a veritably vibrant letter justice. No plain vanilla would do, and only an interesting, amped up version of a recipe would do. As such, I’ve made vegan even healthy (surprise ingredient listed below…!) and chocolate even chocolatier (that may not be a real word, but just roll with it) with these Vegan Chocolate Cupcakes with Chocolate Coconut Frosting. In a large bowl mix flour, baking soda, salt, cocoa, and sugar and blend well. Add in your water, oil, vanilla, and vinegar and mix well. Using a blender or food processor, chop up kale (or kale and spinach mixture, depending on what blend you choose) until no large flakes/leaves remain. Remember, you don’t want people to be able to detect any leafy greens in your final product, so be sure to purée it well. Next, fold in your chocolate chips. Pour into a prelined 12 cupcake baking pan, filling each liner 3/4 of the way full. Bake in the oven at 350 degrees for 15 mins. Let cool completely, then ice them with frosting. Chill can of full-fat coconut milk in the fridge overnight. When ready, flip can over and open with can opener. Pour off the water (you can save it for a smoothie or discard). Scoop only the solid white coconut cream into a pot. Add the chocolate chips into the pot as well and gently melt the coconut cream and the chocolate chips together over low heat. Stir frequently and be careful not to burn. Transfer this mixture into a bowl (cover with wrap) and then into the fridge for 2-3 hours (or overnight) until it firms up enough to whip into frosting. You really just have to eyeball it as I expect the timing for individual batches will differ depending on how cold your fridge is. You’ll want it so that it’s firm enough to hold its shape when you frost with it, but it can’t be too hard (as you’ll need it to be soft enough to whip up with your mixer). You can always leave it out on the counter for a while if it’s too dense immediately after removing from the fridge. When it’s firmed enough to your liking, whip it with electric beaters until smooth and creamy. Add in your powdered sugar here as well (after it has softened up from being beaten but before it’s completely finished, as you’ll want to make sure the sugar is really well-incorporated obviously). Frost away now! If you’re not serving these cupcakes immediately, consider putting them back in the fridge, as your frosting may melt on a particularly hot day. Is it such a thing? Could healthy cupcakes really exist? Well, probably not. But these are pretty close! The best part is, you can’t even taste the kale, and you definitely can’t tell that they’re vegan! 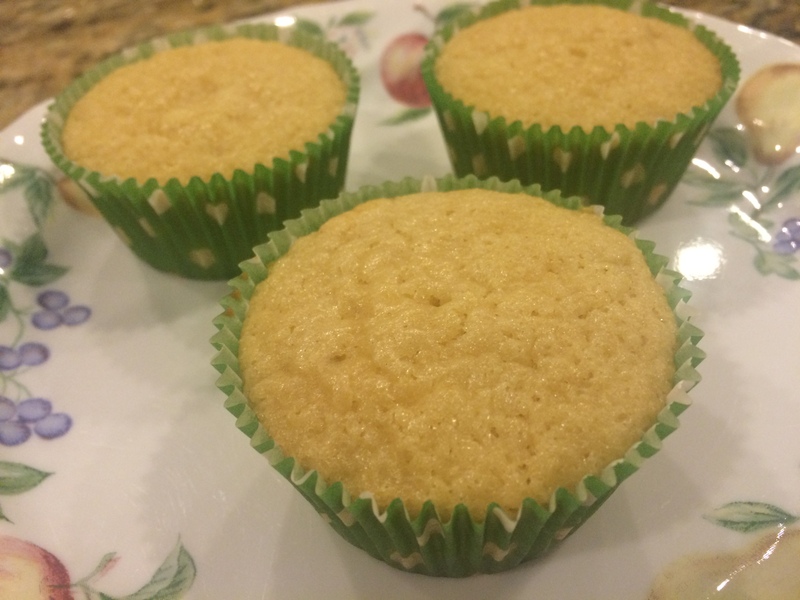 (I conducted several taste tests before telling people the ingredients, just to make sure these cupcakes could pass not just the “vegan” bar, but the “normal” cupcake standards, as well.) I think if you look back on my previous posts, you’ll see that I usually don’t hold back when it comes to honesty, failures in the kitchen, etc…. I promise that holds true here as well. If you’d like to take baby steps though, maybe try leaving out the kale this time. Or at the very least, definitely give the frosting a go, as I would consider using that fudgy icing on non-vegan cupcakes, too! I hope you enjoy this recipe, and I’m so glad to be back posting on the blog again. I’ve missed you guys! Stay tuned for a, dare I say it, non-cupcake recipe post??? *gasp*—I promise you guys will LOVE it though. Get excited! I just wanted to apologize to all of you for my lengthy absence from the blog! The end of junior year was crazy, and summer was just as busy. Any free time that I found was spent recovering from the madness (aka taking a nap) or baking in order to fulfill customers’ orders. I’m going to try carve out time my senior year, but it’s hard to work on blog posts when I have a (virtual) stack of college essays to be doing! Still, I truly love working on this blog, so I promise to fit in posts whenever I possibly can. Anyway, I mainly just wanted to tell you that I do have another recipe in the works, and I haven’t forgotten about The Amazing Bake. In the mean time, I’ll leave you with some pictures of my latest projects/creations. I’ve had to step up my fondant game in the last few months! I hope you’re all doing well, and take care everyone. Fall is just around the corner… get excited! Thanks you guys. Love you!